The leading vendor of NAND flash memory chips, Toshiba is adding another cutting edge fab at its semiconductor chip manufacturing facility in Mie, Japan. The construction of this fab to start at the end of August this year and be completed in summer next year. Yokkaichi Operations already has three fabs manufacturing NAND flash memory ICs. 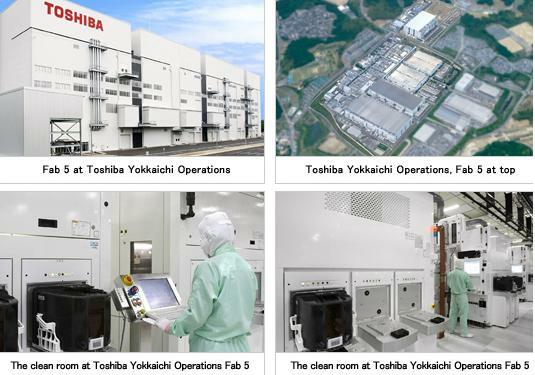 This newly planned fab is part of Toshiba's Fab 5 which has two phases, phase-1 went into operation in July 2011 and this planned fab is phase-2. Along with next-gen NAND flash memory chips, Toshiba also make use Fab 5 phase 2 for production of 3D stacked memory devices that are expected to find growing application in coming years. Fab 5 phase 2 feature automated product transportation system and quake-absorbing structure designed to minimize environmental loads. With LED lighting and other energy-saving production features such as effective use of waste heat, the phase 2 of Fab 5 to cut CO2 emissions by 13% compared with Fab 4. Fab 4 has the ability to handle 800,000 wafers per month, and we guess Fab5 to have same or even higher wafer handling capacity. As per Toshiba's announcement in May, company is already producing 19nm based 2 bit/cell 64Gb NAND flash memory chips by now.